Will Dennis Quaid’s first foray into series television bring big ratings? Will Vegas be a success or end up being cancelled like so many other newbie shows? Watch the ratings to find out. Vegas typically airs on Tuesday nights at 10pm on CBS. The cast also includes Michael Chiklis, Jason O’Mara, Carrie-Anne Moss, Sarah Jones, and Taylor Handley. There are 22 21 episodes. Below are the TV show’s ratings for the 2012-13 season, the best way to tell if Vegas will be cancelled or renewed for season two. Final season averages: 1.5 rating in the 18-49 demographic with 9.75 million total viewers. 0.9 in the demo (0% change) with 7.20 million (-2% change). Season averages: 1.48 in the demo with 9.75 million. UPDATE: CBS has cancelled Vegas after one season of 21 episodes. 0.9 in the demo (-10% change) with 7.38 million (-2% change). Season averages: 1.51 in the demo with 9.88 million. 1.0 in the demo (+100% change) with 7.50 million (+74% change). Season averages: 1.54 in the demo with 10.01 million. 0.5 in the demo (-38% change) with 4.32 million (-40% change). Season averages: 1.57 in the demo with 10.15 million. 0.8 in the demo (-11% change) with 7.20 million (-6% change). Season averages: 1.63 in the demo with 10.49 million. 0.9 in the demo (-40% change) with 7.67 million (-19% change). Season averages: 1.68 in the demo with 10.70 million. 1.5 in the demo (0% change) with 9.52 million (-7% change). Season averages: 1.73 in the demo with 10.90 million. 1.5 in the demo (-21% change) with 10.25 million (-9% change). Season averages: 1.75 in the demo with 11.00 million. 1.9 in the demo (+19% change) with 11.23 million (0% change). Season averages: 1.77 in the demo with 11.06 million. 1.6 in the demo (0% change) with 11.27 million (+3% change). Season averages: 1.76 in the demo with 11.04 million. 1.6 in the demo (0% change) with 10.92 million (+11% change). Season averages: 1.77 in the demo with 11.02 million. 1.6 in the demo (+7% change) with 9.82 million (-5% change). Season averages: 1.79 in the demo with 11.03 million. 1.5 in the demo (-6% change) with 10.33 million (+11% change). Season averages: 1.81 in the demo with 11.17 million. 1.6 in the demo (-11% change) with 9.35 million (-8% change). Season averages: 1.85 in the demo with 11.27 million. 1.8 in the demo (+13% change) with 10.12 million (-3% change). Season averages: 1.89 in the demo with 11.55 million. UPDATE: CBS has trimmed the episode order to 21 installments. 1.6 in the demo (-6% change) with 10.41 million (-3% change). Season averages: 1.90 in the demo with 11.78 million. 1.7 in the demo (+6% change) with 10.75 million (-1% change). Season averages: 1.96 in the demo with 12.06 million. 1.6 in the demo (-20% change) with 10.8 million (-8% change). Season averages: 2.02 in the demo with 12.39 million. 2.0 in the demo (0% change) with 11.78 million (-3% change). Season averages: 2.17 in the demo with 12.91 million. 2.0 in the demo (-20% change) with 12.11 million (-19% change). Season averages: 2.25 in the demo with 13.48 million. 2.5 rating in the 18-49 demographic with 14.85 million total viewers. Season averages: 2.50 in the demo with 14.85 million. Compared to Unforgettable’s series debut a year earlier, CBS was down by 14% in the demo (vs a 2.9 rating) and down by 4% in viewers (vs 14.09 million). While the viewership is very impressive, the demo is less so and CBS has cancelled many series for low demo numbers. What do you think? Do you like the Vegas TV series? Do you think it should be cancelled or renewed for a second season? Vegas: Should the CBS Show Be Cancelled? 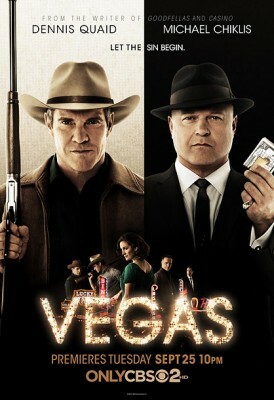 I am disappointed that CBS canceled the tv series Vegas with only 21 shows and only one season. Maybe if CBS had put it in an earlier time slot they would have gotten more viewers. This was a great show and great cast! They should have given it another chance instead of replacing it with stupid shows. Was probably TV politics. I just watched the series on Amazon and loved it. Wish they had given it several more seasons. REALLY.. You keep all the crap shows and cancel the GOOD ones ,what wrong with this picture .Vegas is great and was set in a great era. Cast? Good tv is hard to come by. We enjoyed watching Vegas, finally something good on TV again and we looked forward to watching it every week. Much better then the reality shows. Sorry to hear it was cancelled. Finally something creative to watch, they should have placed in a better time slot, it would have probably been more successful. I really enjoyed the show. I got on the internet to see when it was coming back on to find out it was canceled. Damm!